I didn’t do too much research before my trip to Asia. I really just wanted to play as much of it by ear as I could. But ultimately, I couldn’t help but add one stop to my list when I learned that there was a burger food cart in downtown Vientiane. I mean seriously, how could I NOT try it? The excitement level was high as trip went on, but I began to discover that the beef quality in Southeast Asia is very poor. As the stop in Vientiane was in the last week of my five week journey across the world, I knew what to expect quality-wise. 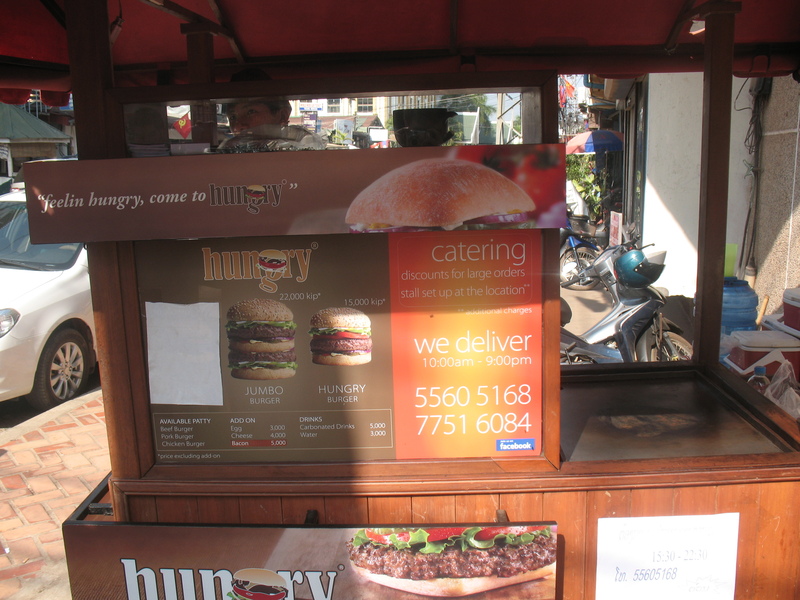 So after wat-hopping around the scorching hot city for a few hours, we found Hungry Burger on a random street corner. I think my friends Jesse and Gabe thought I was a little bit nuts (they’re right), but I ran right up and looked at the menu. I’ll let you decide for yourself, but Hungry Burger is like straight out of Portland. The menu is all in English, so it clearly caters to a certain crowd. But for a brief moment, I was swept back across the world to Oregon. I bet these guys are doing a pretty good business because the whole experience is totally a taste of home. And given that street food standards in Southeast Asia aren’t all that high, I was relieved to see that Hungry Burger was kept in immaculate condition. Seriously, there wasn’t anything Laotian about this place except the workers, who ironically didn’t speak a lick of English. But B^4, enough about your epiphanies, how was the freakin’ burger? Well, let’s check it out. I ordered the Jumbo Burger, which is akin to a Big Mac (not that I’ve ever had one – seriously I haven’t). At 22,000 kip, you’re dropping about $2.75 USD for this burger – which is expensive likely because you’re having a lot of luxury foods in Southeast Asia when your order a double cheeseburger! Through no fault of Hungry Burger, the beef quality wasn’t very high. The beef in general just isn’t very good. My suggestion would be to use water buffalo, as I’d enjoyed some of that the night before at dinner, and it was delicious. The cheese was cheesy, and the bacon was sadly nonexistent, as they were out of bacon! Sad face! 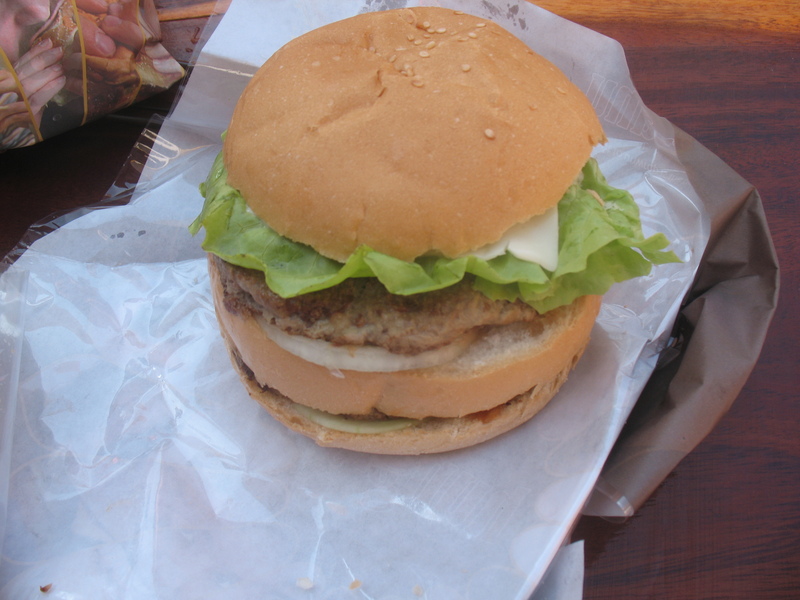 But fortunately, Laos has kept her French colonial tradition of making great bread, so the bun actually made the burger. It was soft enough to soak up all the juices, yet thick enough to not get soggy. Ultimately, it seems like everything in Southeast Asia [that isn’t congee] has flavor. Even though you have this low-quality beef, it was still a flavorful burger, and knowing that the quality wouldn’t be that high, I had my expectations set just right. It actually kinda hit the spot. If I’m ever in Vientiane again, well, c’mon how could I not go back? A little taste of Portland…in Laos.